Despite it being almost April, the weather is apparently still doing the Narnia thing, so I decided it was necessary to turn once again to the warming and homely single malt whisky as my evening drink of choice. With that in mind, last weekend I bought myself a bottle of Balvenie 12 year old Doublewood. Why? The double casking, the description and (a little too honestly here) the nice label played a part, but it was also £28 down from the RRP of £33.90 in Asda. So was it worth it? 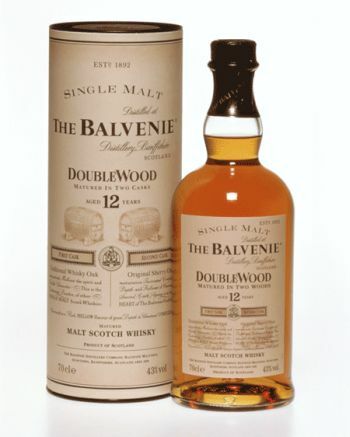 The nose on the Balvenie is supremely creamy with vanilla, toasted oak, spicy honeyed fruitcake - not too far removed from sherry. In fact, something slightly unusual about the Doublewood is that it is stored in two barrels - the first whisky oak and the second sherry. Despite only being casked in the sherry barrel for 2 months of it’s 12 years this gives an extra fruity quality that you might not otherwise find. The taste is fantastic: lots of spicy fruit, toffee and oak, this is a mellow and creamy whisky with the slightest hints of vanilla coming through. There's even some citrus if you can be disciplined enough to pour it and leave it for half an hour (I recommend a snooze in an armchair by a great big log fire while you wait). There is not too much heat off it at the back of the throat, however there is the wonderful warming effect down the chest I was looking for. The finish is a little short with the flavour dissipating fairly quickly which is a shame. All in all, this is a single malt for the masses - not too austere for the newcomer or lacking in complexity for the veteran, there’s something for everybody. For the time being I am finding warmth and cosiness in this lovely malt, but the Pimms season cannot get here quickly enough. This was a post by our resident whisky and rum fanatic, Hugo Fountain. Awesome. I'll be looking for a bottle of this as it sounds right up my street. Thanks!